A popular Downtown building for sports bars will soon be filled once more, with another sports bar. In fact this new sports bar, which will be called 24 Taps Sports Bar, is planning to basically open a new version of Heroes & Legends, one of the former businesses that was once in the new 24 Taps' space. Northtown Mall looking for "unique food businesses"
Ever since the redevelopment of Northtown Mall was announced late last year I've been keeping an eye and ear out for more on these plans. And while I'm really only going on a post on Facebook it looks like the mall might be planning to have some new unique food options. Perhaps even a version of the Portland style food carts? With as little as day's to go ( although probably will be a little longer ) till Washington State's first ever recreational marijuana shops open, we've finally gotten around to compiling a list of where in our area all of these shops will be. A national chain big & tall clothing retailer is planning a new mid box size store in Spokane Valley. The new store will join a handful of new tenants in building currently under construction next to Total Wine & More in the Evergreen Crossing Shopping Center. The former Spokane Public Market building at 32 W. 2nd Ave in Downtown Spokane is about to get an exciting new tenant for the now largely empty historic building just to the East of the main Downtown core. TSA has opened a new office in Spokane Valley with the main purpose of enrolling local area travelers in the government agency's program that allows for faster and easier check in at many airports around the United States, including Spokane International Airport. General Nutrition Corp. , a nationwide chain that does business under the much more recognizable GNC name is expanding their presence in Spokane by opening 2 new locations. One location will be in Spokane Valley and another in the heart of Downtown Spokane. Just in time for the big events like Ironman, Fourth of July,etc... comes a couple of exciting new bars and restaurants in the resort city of Coeur d' Alene. Goodwill Industries of the Inland Northwest is investing even more in the Inland Northwest with the planned opening of a new Goodwill Thrift Store opening later this year on the South Hill. Living in the Spokane area you've no drought seen the national TV ad's for the Party City chain of party supply stores. But we've never had any locations so locals could only watch and not partake in the thousands of party and event merchandise for most any occasion. But that's all about to change as Party City will soon be opening two stores locally, one in North Spokane and another in Spokane Valley. After a long phase of construction, and before that some time of sitting empty, the former Eastern Washington University Spokane building is now full once again. The building has undergone many upgrades and even has acquired a new name. Exciting news has come in this week from the people behind Coeur d' Alene's Riverstone development. Three more new tenants have been announced for the lifestyle shopping center, in addition to all the other happenings all around the once stalled mixed use development. Looks like the large new, Convention Center Hotel being built by developer Walt Worthy isn't the only big news coming to us from the hotels of Downtown Spokane. One of the way's I check for new businesses and development projects coming to the Spokane area is by checking the most recently filed building permits. I figured I take some time out and share some what the permits are showing for Spokane, because right now they're showing some exciting news. Much of that news will be reported on once I gather more info from other sources. Provo,Utah based Vivint has announced that they plan to close their call center and offices in Liberty Lake. Vivint has only operated in the Inland Northwest since last Summer following their opening announcement in June of 2013. Late last week we learned of yet another new tenant to be added to the growing list of shops and restaurants that will open in the now under construction, Regal Plaza shopping center on the South Hill at the corner of Regal and Palouse Hwy. 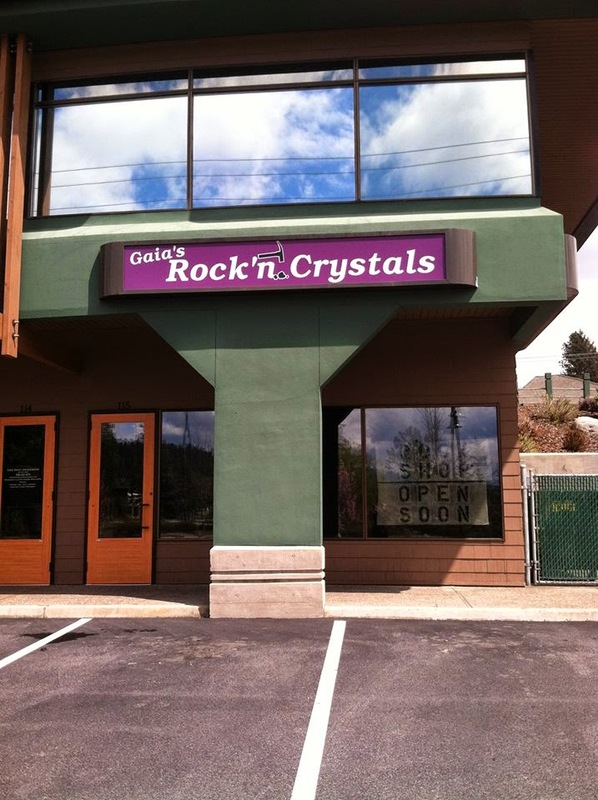 "Rockhounds" and others will no doubt want to check out one of the newest businesses in Coeur d' Alene. That new business is a rock and gift shop that opened a couple of months ago, just a few blocks north of Downtown in the Harbor Plaza Shopping Center ( 610 W. Hubbard )and is called Gaia's Rock'n Crystals.